What coincidental timing on your post. 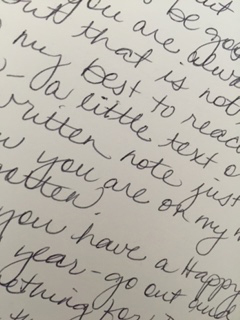 Day before yesterday I was surprised to receive a handwritten note in the mail from someone I greatly admire. She’s a busy professional, so first off it was a gift that she took the time to write a note. Secondly, it was fun to look at the nuances of her writing style. Unlike a typed letter ever would have, the note made it feel as if a part of her was here with me.